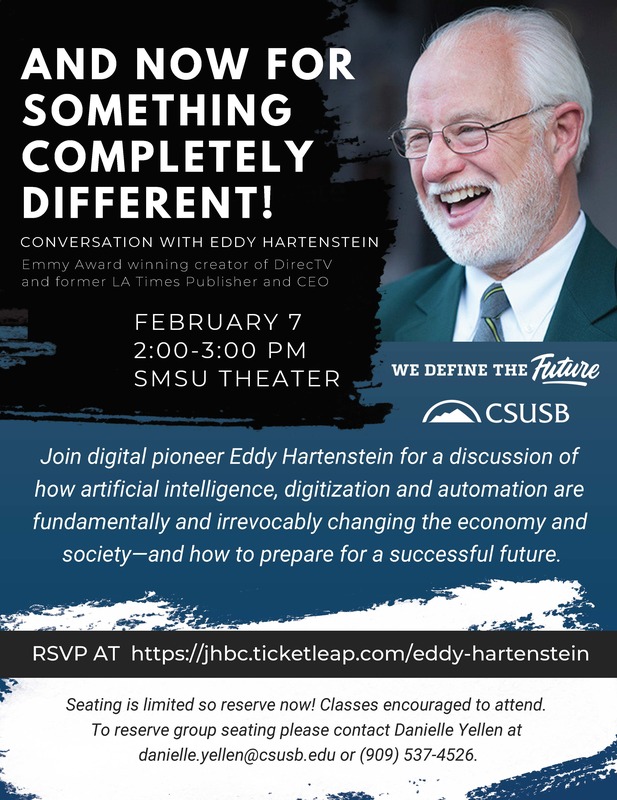 Digital pioneer Eddy Hartenstein, who revolutionized consumer electronics in the 1990s with the development of satellite TV, will visit Cal State San Bernardino on Thursday, Feb. 7, for a discussion of how artificial intelligence, digitalization and automation are fundamentally and irrevocably changing the economy and society – and how to prepare for a successful future. Hartenstein’s talk, presented by CSUSB’s Jack H. Brown College of Business and Public Administration, will be held from 2-3 p.m. in the university’s Santos Manuel Student Union Theater. Seating is limited and classes are encouraged to attend. To reserve group seating, contact Danielle Yellen at Danielle.yellen@csusb.edu or (909) 537-4526. RSVP to the event page online at “And Now For Something Completely Different!” on TicketLeap. During his career, Hartenstein served as publisher and chief executive of the Los Angeles Times from 2008 to 2014. He held similar roles with the Tribune Co. prior to the 2013 split that divided its broadcasting and publishing businesses into separate companies. Hartenstein’s impact can be seen in a number of fields, from engineering for his work at Hughes Aircraft on the Pioneer Venus probe, which orbited the planet Venus and the company’s commercial satellite division, to his later pioneering role at DirecTV. He currently serves as a board member at Broadcom, TiVo, and Sirius XM Radio, where he is also lead independent director. He previously served as a director on the boards of City of Hope, Oath (formerly Yahoo! ), SanDisk, Technicolor (formerly Thompson Consumer Electronics) and Converse (prior to its acquisition by Nike). An alumnus of Cal Poly Pomona (CPP), Hartenstein was awarded the honorary degree of Doctor of Science from the California State University Board of Trustees and CPP in recognition of his accomplishments in business as a leader and innovator. Hartenstein has also been inducted into four halls of fame as well as membership in the National Academy of Engineering. He was presented with a lifetime achievement award from the National Academy of Television Arts and Sciences.